Mailbag: Las Vegas Shooter Labels And Their Subtext : NPR Public Editor Listeners asked about language and audio choices made during NPR's special coverage of the Las Vegas shooting. 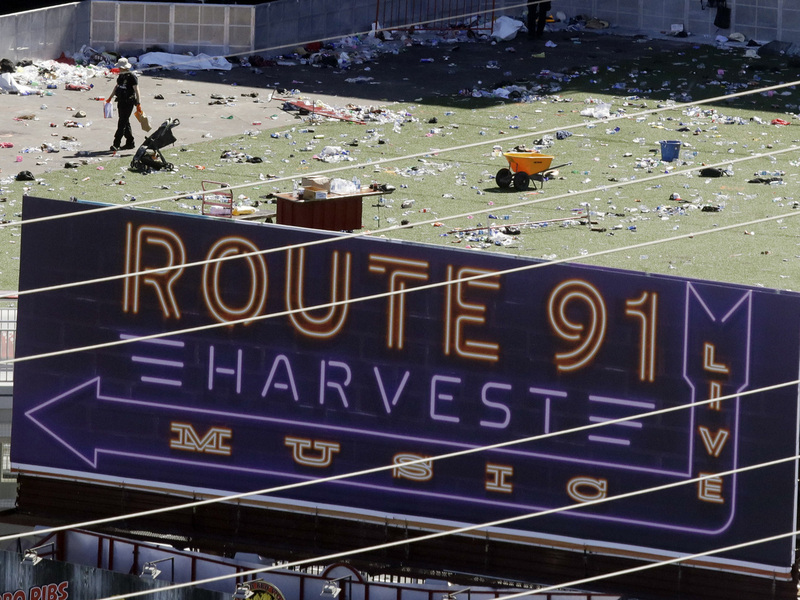 Investigators work the scene on Monday after a mass shooting at a music festival near the Mandalay Bay resort and casino on the Las Vegas Strip on Sunday in Las Vegas. "Lone wolf" or "domestic terrorist"? Sunday night's Las Vegas shooting brought a strong response from NPR's newsroom, but, as with any major breaking news story, listeners and readers had questions and complaints. Chief among them was how NPR referred to the now-dead gunman, a white man. As has been the case with all major news-garnering attacks that involved white men in recent years, some in the NPR audience immediately insisted that NPR should be calling the event "domestic terrorism." NPR has not used that term. It did, however, repeatedly quote Clark County Sheriff Joe Lombardo's reference to the killer as a "lone wolf." That juxtaposition in particular drew criticism from some listeners. On the NPR Ombudsman Facebook page, a listener named Sean McGovern set off a lively discussion with his post: "Enough with the 'lone wolf' talk. Call domestic terrorism what it is." Legal and other definitions are important, and NPR had a good on-air discussion of "domestic terrorism" this week. But what NPR's critics are really arguing about is something different: At their core, the complaints are about whether NPR has been consistent in how it treats attackers who are white versus those who are Muslim, or brown or immigrants (or all three). If it is using the words "terrorism" mostly in connection with attacks perpetrated by minorities, the argument goes, NPR would be perpetuating stereotypes. These are not inconsequential considerations. Stereotypes can carry serious consequences and should be avoided. Mark Memmott, the editor who oversees standards and practices in NPR's newsroom, told me this week that his approach remains the same as it has been: NPR uses action words to describe what a person does. And, he said, "We have to wait to see what information develops about the motivation of the person." He added, "Maybe we're too cautious," but he also rightly notes that this considered approach has served NPR well in the past, as in the April bombing of a soccer team's bus in Germany, which some (but not NPR) immediately labeled terrorism, when in fact it turned out that the bomber had a profit motive. The main question for me, then, is whether NPR itself has been consistent. Some other news outlets and some officials are indeed quick to throw around the terrorism label, but NPR cannot answer to what decisions are made by other news organizations. I judge these issues by NPR's standards, and whether it is living up to the journalism best practices it espouses. For the most part, NPR has been consistent; it rarely uses "terrorist" or "terrorism" in the early days of reporting on any attacks, except when officials have first used it. That applied to the Pulse nightclub shooting in June 2016 and to Charlottesville in August, when a woman was killed after being hit by a car at a rally. The newsroom should continue to be cautious in this way. The use or avoidance of "lone wolf" is a slightly less clear-cut decision for me. In this case, it was first used in a quote from law enforcement, so that argues in favor of at least a few uses early on. But that in and of itself is not enough of a justification to keep repeating it, as NPR did throughout the day. For one thing, as a few listeners pointed out, the phrase can be seen as romanticizing the shooter (so could calling someone a "domestic terrorist," for that matter). It is also cliché. And, Memmott noted, NPR should avoid police jargon. There are much better ways of saying that the killer acted alone, including that very phrase. The "lone wolf" phrase also has racist undertones. As Monica Hoel of Emory, Va., wrote my office: "If he's a white guy, call him a white guy. I've never heard a shooter with a Muslim-sounding name called Lone Wolf. I've never heard a shooter with an African American heritage called a Lone Wolf. Lone Wolf sounds like a Kiefer Sutherland character. I count on NPR to not contribute to bias." I looked back in NPR's archives and NPR has indeed, more than once, quoted officials who use the phrase "lone wolf" to refer to attackers who are apparently Muslim, including the attacker at the Flint, Mich., airport in June. More commonly, the phrase is used by officials to refer to white attackers, however. NPR should largely avoid using it, in my opinion. As with many newsroom ethics decisions, there is no right or wrong answer here. Here are some other takes on this subject, for consideration, from Masha Gessen in The New Yorker; Indira Lakshmanan, the Newmark chair in journalism ethics at The Poynter Institute, and Andrew Seaman, chairperson of the Ethics Committee of the Society of Professional Journalists, and a health reporter for Reuters. Overall, I found NPR's coverage of the Las Vegas massacre so far to be careful and considered. Compared to past breaking news situations, there were very few slipups when referring to the weapons involved (an ongoing challenge for NPR, which in the past has sometimes gotten the terminology wrong). NPR has been rightly judicious not to overuse the killer's name, while at the same time not avoiding it entirely. Listeners raised a few other issues, however. Marlene Marshall, of Rhode Island, wrote: "Once heard how does one let go of the horror of hearing people being shot? It feels to have attached itself to my brain and is not welcome." NPR did play audio of shots being fired. Most often, the show hosts were good about giving listeners a warning first, so those who wished not to hear that audio could tune away. But in the Up First podcast, the 5 a.m. newscast and again at 8:19 a.m., the shots audio played with no warning. In my opinion it should not have. One justification for using these clips has been in discussions of how the sound suggested the shooter was using an automatic weapon. Even so, that does not merit repeated use of what clearly is shocking audio. A "Record" Made To Be Broken? Becky Froass of Silver Spring, Md., wrote: "I find it very frustrating that every story about the Las Vegas shooting, every mention, every interview, etc. must begin with the words 'the deadliest mass shooting in modern American history.' I have heard that phrase 40 or 50 times since Monday morning and I think it is unnecessary, not to mention, redundant. Also, I believe it offers a 'challenge' to someone to try to make deadlier attack that may be the 'deadliest'. Why is this description necessary so constantly?" We got a number of similar complaints. Part of the challenge is that this listener (and others) seem to be listening to all the coverage; the average listener, however, tunes in for only a short period of time. NPR's journalists must program for them, too, and bring them up to speed quickly when they tune in seeking information. Of the phrase itself, Memmott told me: "It certainly says something about the level of horror and, to get back to that other word, terror. The numbers are just stunning." As he notes, context is important, because "one of our jobs is to contribute to the public discussion and give people the information they need to make informed decisions." I agree with his observation that, if NPR did not put it in some kind of context, NPR could find itself accused of making mass shootings seem even more routine than they are already becoming. Heather Williams of North Adams, Mass., wrote: "What I'm hearing is your reporters talking about victims they know absolutely nothing about, giving me information that has clearly been gleaned by combing through relatives' and friends' Facebook posts and passed on, seemingly without permission from those relatives and friends." And a listener named Alexis, from Chelsea, Mich., wrote: "I understand that in today's 24/7 news cycles that it's hard to get new information, but I believe reading people's personal Facebook posts on national radio crosses a line, regardless of whether or not the posts are viewable by the public or not. One thing is to quote a business or other public entity, but to quote people's private posts grieving a loved one is not journalism, regardless of if their permission was granted to share the post. We are not their intended audience. I do not think that most people know whether or not their Facebook posts are public, and yes, that is their error. However, I expect more from NPR." One of the stories in question quoted a Facebook post from the mother of one of the victims. Memmott told me the newsroom attempted to reach the victim's mother to get her permission (and presumably an interview), but was unsuccessful, and decided to use the post, given that it was public. "The old-fashioned part of me still wishes they were able to cross that final T," he said, but added that he understood the pressures of a deadline, and the desire to turn the focus away from the killer to the victims. Social media is a potential landmine these days, as authenticity and privacy issues abound. Permission should have been sought, in my opinion. Editorial researcher Annie Johnson and intern Holly Pretsky contributed to this report.